🎖 Plugin ranks 1,356 amongst 50,000+ plugins. 🎂 This plugin celebrated it's 8th anniversary 3 months ago. 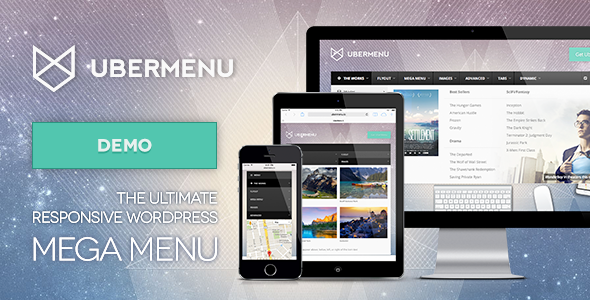 UberMenu™ is a user-friendly, highly customizable, responsive Mega Menu WordPress plugin. 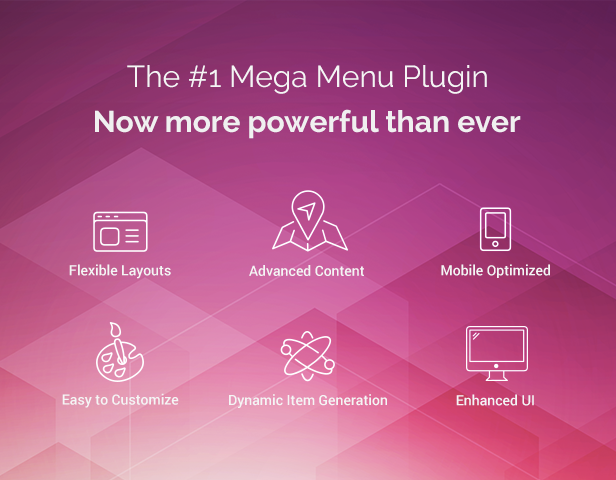 It works out of the box with the WordPress 3 Menu System, making it simple to get started but powerful enough to create highly customized and creative mega menu configurations. 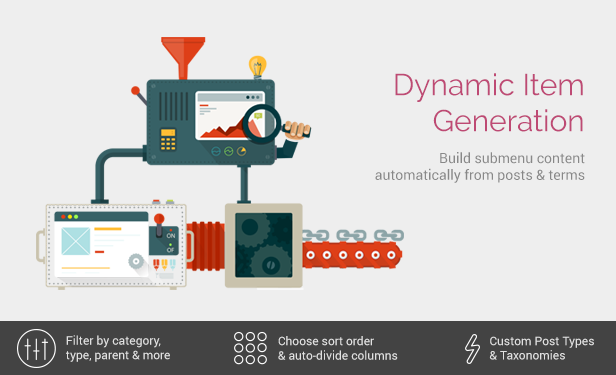 Integrates directly with the WordPress 3 Menu Management System – work with the system that you know and love! 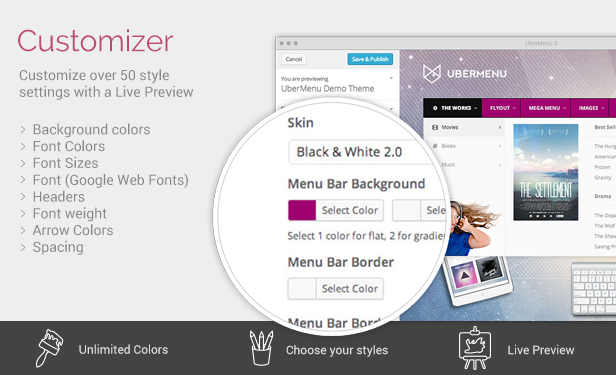 If your theme has not properly implemented WordPress 3 Menus, UberMenu may not work out of the box due to interference from the theme. 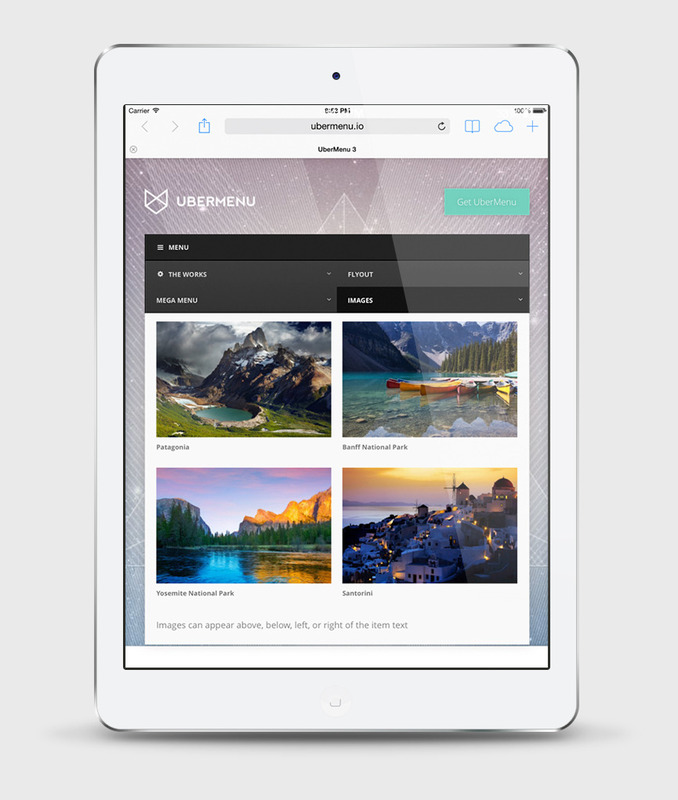 You can add it to your site with a line of code via Manual Integration. See Will UberMenu work with my theme? Always read the update instructions! 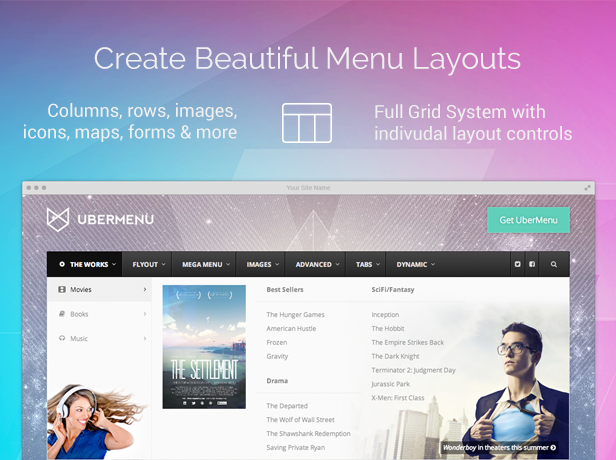 * Complete rewrite of UberMenu from the ground up. Detailed change log coming soon. * WordPress 3.5 compatible (only issue was updating the Administrative Tool Tip Tour Script for jQuery 1.8 compatibility). 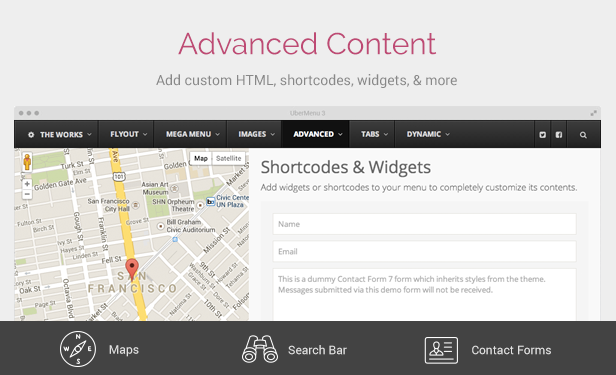 * Improved compatibility with plugins that don&apos;t use jQuery closures properly. However, it is recommended to upgrade the entire package together. Be sure to back up first, especially custom styles! 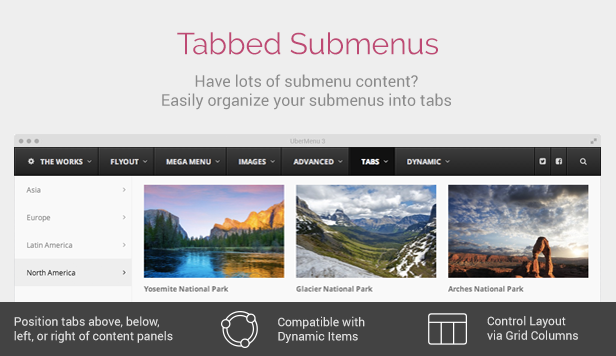 Use UberMenu in text widgets, improved widget alignment, and better support for non-standard compliant themes. * Added control panel option switch in and out of jQuery noConflict mode to better support themes that don&apos;t follow WP coding standards. * Top level widget capabilty - add a search box widget to your menu bar! 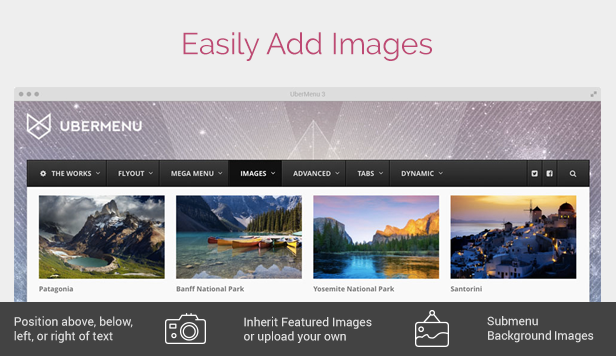 * Improved featured image handling - fixed issue that overrode featured image capability with certain themes. 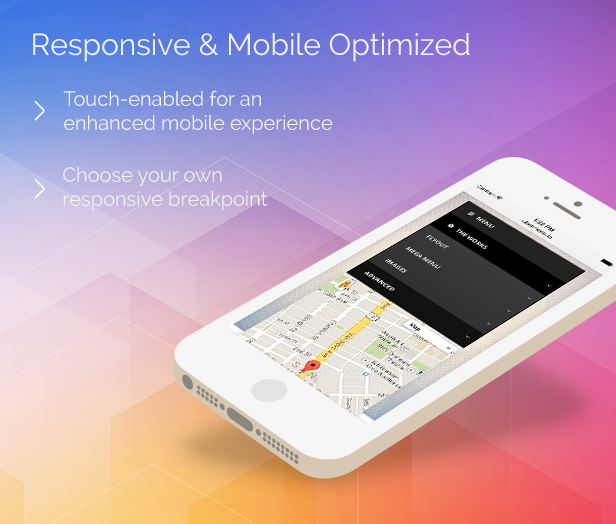 v 1.0.2 makes the Menu Item Image support more robust. 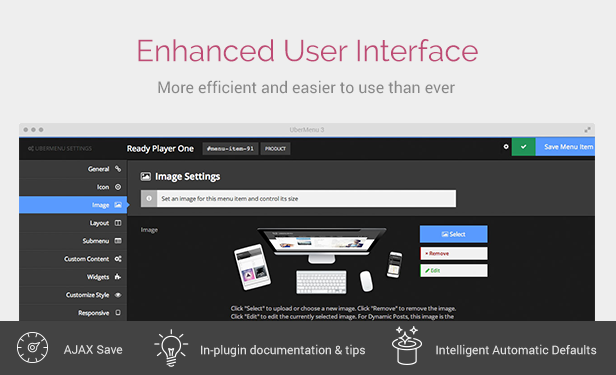 Depending on how the relevant theme is implemented, in certain cases it can keep the plugin from enabling featured images on menu items and vice versa. This update will fixes that issue by making sure both can work together. v1.0.1 fixes an issue with the included shortcodes (columns and recent posts w/ excerpts). If you are using or intend to use these features, please upgrade   Don&apos;t forget to backup your custom.css file if you&apos;ve made style customizations! Probably the best menu on the market! Awesome product and incredible customer support! Top notch! Nice plugin. Helped me align a menu in the centre and lots of other nice features.